Heaters came home at the end of last summer and found out they had less than a week to find a new spot. Their original home, the one they’d been renting, had just been sold. 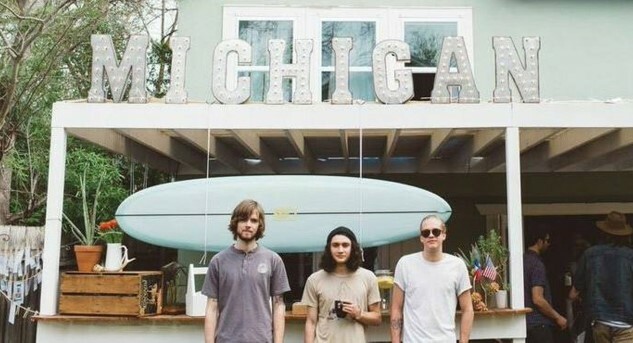 The Grand Rapids, Mich.-based trio had been living together through for their first year of existence, leading up to the release of their second album Holy Water Pool in late September. Krebs and lead guitarist Andrew Tamlyn first forged this fruit-bearing musical camaraderie when they were in high school together and kept in touch during their respective college runs (Saginaw Valley State for Tamlyn and Northern Michigan University for Krebs). The duo first bonded over older surf styles and garage rock records. The songs you’ll hear on Holy Water Pool are imbued with the swirly sweetness and delayed distortion of those flavors of rock, somewhat vintage-inflected vibes that have a shimmying groove but can also kick it up to a more frenetic punk spasm tempo. Right, and the writer should just spring from the specific-yet-vague evocations wrung from Heaters latest batch of songs that could also be a universally shared pseudo-hallucinatory sensation when one really takes that deep dive into the headphones. Snaky guitars layer a deceptive sound, and yet over the horizon at the same time come vocals sounding like garbled communiqué crackling from a dented transistor radio inside of convertible Cadillac Eldorado sidelined off Route 66, baking in the sun, or rhythms as propulsive as fiberglass boards jettisoned through the peeling pipelines of an indifferent tide. I just like that Heaters music makes me feel surrounded (in a non-ominous way,) or, encircled … by a beautifully gritty and melodic clamor, a caustic and cool boogie that doesn’t just run, punk, kick and then quit, but fills the soundscape with a purple-tinged haze and suggests a feeling of being in the room with the guys, in their home, whichever home, down in their basement with amps all around you. But first, a bit more exposition: Krebs said the heat was truly on for Heaters once they added drummer Josh Korf and began to hit the road as a power trio. The band put out a super-sized EP called Solstice on Dizzy Bird Records back in October of 2014. In 2015, they started touring like monsters and released a 7” (Mean Green) on Beyond Beyond Is Beyond Records, which began bending more and more ears at music zines around the internet. The band recorded this breakout album with a couple of local friends and wound up mixing most of it themselves. That won’t be the case for Holy Water’s follow-up, Krebs said. There’s the double-boost of having wrapped an album in a proper studio (this time,) and getting ready for a European tour at the end of January. Heaters are also stopping in Detroit to play a festival called The Secret Friends Fest, which has several similarly-situated “just on the cusp” touring bands (like Leggy out of Cincinatti or L.A.-based Mild High Club). The fest is sort of a shot in the arm for a small batch of bands who represent a surfeit of bands out there—each wholly familiar with the whole Van Life experience. And winter is here, strangers, so if your heat(er) works, that’s a bonus!